People who keep a hand gun in the home have a responsibility to secure that weapon behind a locked door or drawer, particularly to keep children from accessing it. The GunVault MVB500 Microvault Biometric Pistol Gun Safe is an ideal safe in which to secure a weapon and the ammunition that goes with it. Featuring biometric technology to open and solid construction to resist tampering, this safe is bound to be a welcome addition to many homes where children live. Your fingerprint is what opens this safe and you can code up to 30 fingerprints into its computer system. That means that you can authorize other people to access the safe, too. GunVault’s biometric technology uses a high-performance algorithm that allows it to quickly identify enrolled fingerprints and release the locking mechanism to authorized users while prohibiting access by non-enrolled fingerprints. The algorithm has a self-learning feature, too, that allows it to add minor changes to the fingerprint templates every time an authorized user touches the sensor. This updates any slight changes such as minor scars or blemishes that might occur to a fingerprint over time. In addition to the fingerprint scanner, user access codes can be set on this safe’s computer system. There are more than 12 million codes available, so you’re sure to choose one that is unique and unbreakable. The system features audio feedback to let you know when you’ve entered a correct code. There is also a feature that allows you to disable the audio so that you can open the safe without that audio feedback – a handy feature in threat situations. Four AA batteries give power to the scanner and code system so you won’t have to worry about electricity outages affecting its performance or your ability to get to your weapon. There is also a key that you can use to open the safe if and when the batteries run out of juice. An additional feature that many other gun safes do not have is a tamper indicator. This lets you know whenever invalid attempts have been made to open the safe. Repeated invalid entry attempts will block access until you release the system. When that happens, you can investigate who has been attempting to access your weapon and have a serious conversation with them about gun safety. While GunVault offers gun safes in a variety of sizes, the Micro is perfect for most handguns with its interior dimensions of 10 3/4 inches wide by 6 1/2 inches long by 2 inches deep. The exterior measures 11 inches wide by 8 1/2 inches long by 2 1/4 inches deep so it will fit anywhere in the home. It’s even large enough to store a few documents or some cash, if necessary. 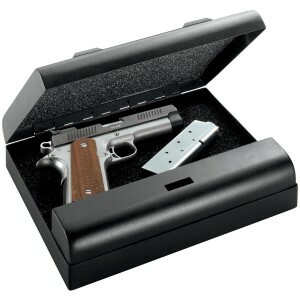 And the safe is constructed of heavy duty grade steel so that it is resistant to attempts to pry it open. At a weight of 5 pounds, the GunVault MVB500 Microvault Biometric Pistol Gun Safe easy to lift and carry along if you want to take it with you on a trip. But it can also be permanently mounted anywhere in your home through the use of four pre-drilled holes in the bottom of the vault. Mount it to a shelf high up in your closet or inside your nightstand. You can even find a hiding place for it anywhere in your home and then bolt the safe into place. That will keep any potential thief from walking off with the safe and its contents. Where Can You Buy This Safe? We recommend that you buy this safe from Amazon. They have this available for under $200 and last time we checked they even had free shipping, which makes this a great value. While some users have reported false negative readings upon occasion, most of these types of problems can be solved with a bit of practice at using the gun safe’s scanner. Often it is simply the angle at which a finger is placed on the scanner that needs to be adjusted. As for size, the GunVault MVB500 Microvault Biometric Pistol Gun Safe won’t hold a large collection of valuable jewelry or computer equipment. But there are larger versions of this excellent safe that can be used for those purposes. It also is not an appropriate gun safe if you own more than one weapon. Again, a larger gun safe would be the answer to that situation. But for a single weapon or a small number of documents, perhaps a couple of rings or a valuable watch, the GunVault MVB500 Microvault Biometric Pistol Gun Safe could be the answer to your security needs. Hello! I just wish to give a huge thumbs up for the good data you have right here on this post. I shall be coming again to your blog for extra soon.